Linux Beach: Bashar al-Jihad: Is ISIS a child of the regime? Bashar al-Jihad: Is ISIS a child of the regime? I did not fear them, I used to tell them they are the regime’s men with a beard and mask. Bashar al-Assad is one smart mass murderer. He has been saying all along that he is fighting al Qaeda and not a revolutionary movement of the Syrian people while at the same time letting al Qaeda leaders, many of them known terrorists and murderers, out of his prisons so they can provide "leadership" to the al Qaeda like groups, the ISIS and al Nusra, that are proving to be a boon to him and a plague on the democratic opposition. Assad also has a history of attacking the Free Syrian Army more that he attacks these jihadist groups, while they have a very spotty record of attacking the regime. Assad also has a practise of bombing Syrian civilians in schools, hospitals and breadlines while leaving the camps and headquarters of these groups untouched. This strategy is working well for the regime. It has caused many that claimed to support the struggle for democracy in Syria to turn their backs on the revolution in the name of "stability," claiming that the victory of his regime is essential for the "war on terror." It has allowed US President Barack Obama to come out of the closet with his support for Bashar al-Assad. He is quickly manuvering to openly put the United States openly on Assad's side. Shamefully, it has been used by much of the US Left to defend the genocidal regime as better than the only alternative they chose to recognize. Shamefully is has been used my much of the US Left to turn its back on the most important revolution of the 21st century to date. Here is a collection of some of the most recent articles on these important developments. Syria’s opposition National Coalition described on Wednesday al-Qaeda-linked group in the country of having ties to the Syrian regime, and accused it of serving the government’s interests. The strong criticism against the Islamic State of Iraq and the Levant (ISIL) comes after the group reportedly tortured and killed an opposition doctor in northern Syria. “The Coalition believes that ISIL is closely linked to the terrorist regime and serves the interests of the clique of President Bashar al-Assad, directly or indirectly,” Agence France-Presse quoted the Syrian opposition group as saying in a statement. “The murder of Syrians by this group leaves no doubt about the intentions behind their creation, their objectives and the agendas they serve, which is confirmed by the nature of their terrorist actions hostile to the Syrian revolution,” it added. It has also accused the group of abandoning the fight against the regime and instead battling other opposition fighters and civilians. According to numerous studies and reports, regime prisons are the womb that birthed the extremist Islamists who have become today’s leaders of ISIS, Nusra, and others. Activist Maher Esper says: “I saw prisoners who were with me in the Saydnaya prison in most YouTube videos since the emergence of Nusra, ISIS, and other Islamic brigades.” Syrian regime forces arrested Esper in 2006 and sentenced him to seven years in prison, five of which were spent at the Saydnaya prison before he was encompassed in the presidential amnesty issued at the start of the revolution. 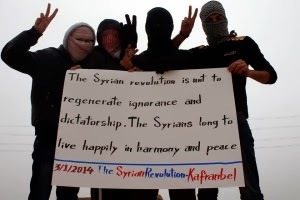 Activists in the village of Kafranbel in Idlib province, noted for their creative and artistic anti-Assad banners, turned their attention to the Islamic State of Iraq and ash-Sham in today’s Friday protest. 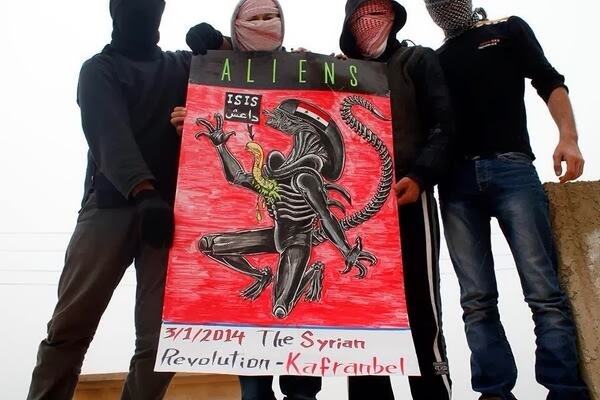 Banners accuse the faction, mainly consisting of foreign fighters, of being “alien invaders”, while others called on the Free Syrian Army to intervene and expel ISIS. The criticism of ISIS comes after the extremist faction stormed media offices in the town last Saturday evening. "The enemies have multiplied but there is one revolution and it lives on." Activists said the raids targeted a radio station, Radio Fresh, and a nearby media center. An activist told Lebanese outlet The Daily Star that fighters from ISIS abducted six media workers, but released them after two hours of detention. ISIS militants also smashed up both the radio station and the media center, stealing or destroying computers, cameras, radio and Internet equipment and pro-uprising banners. The activist told the Daily Star that the attack from ISIS came hours after the station broadcast an item with interviews that included several women discussing their personal lives and problems as divorcees. President Bashar al-Assad has received two enormous gifts in recent months. The first is the Russian-brokered deal to remove Syria’s chemical weapons, which distracted attention from his relentless campaign to kill and terrorize his enemies and also compelled Western governments to work with him as the country’s legitimate ruler. The second is ISIS, which has also deflected attention away from the war between the regime and the rebels and has vindicated as nothing else could Assad’s persistent claim that he is confronting, not political opponents, but “terrorists,” as his foreign minister, Walid al-Muallem, recently claimed at the United Nations. Atareb, #Aleppo province, 03-01-2014: There are unconfirmed reports from Aleppo province that immediately after the FSA drove ISIS forces out of Atareb earlier today, regime heavy artillery forces bombed the town after not doing so for some time, with locals suggesting that this provides further evidence of the regime’s interdependent relationship with the group. ISIS's counter-ultimatum is that in 24 hours they'll let Assad march on Aleppo. As @The_47th has said, no wonder Assad never bombs ISIS HQs. Since its appearance last April, ISIS has changed the course of the Syrian war. It has forced the mainstream Syrian opposition to fight on two fronts. It has obstructed aid getting into Syria, and news getting out. And by gaining power, it has forced the US government and its European allies to rethink their strategy of intermittent support to the moderate opposition and rhetoric calling for the ouster of Syrian president Bashar al-Assad. After months of shunning Islamist groups in Syria, the Obama administration has now said it may need to talk to the Islamist Front, a new coalition of hard-line rebel groups, in part, because they might prove a buffer against the more extreme ISIS. Ryan Crocker, a former top US State Department official in the Middle East, has told The New York Times that American officials, left with few other options, should quietly start to reengage with the Assad regime. In December, US and Britain suspended non-lethal assistance to rebel groups in northern Syria after one base fell into Islamist hands. “Syria is now viewed as a security problem, not one about ousting Bashar and helping the Syrians get what they want,” a Western diplomat in Istanbul told me. ISIS’s rapid growth is subject to much conjecture. The most common speculation I encountered was that ISIS is a creation of Damascus, or its ally Iran, intended to fragment the opposition and ruin the revolution. “Simply, we see it as an extension of the regime,” Khaled Kamal, a sheikh from Latakia now based in Antakya said. While there is little evidence of any direct ties to the Syrian government, it is true that Assad has done all he can encourage the impression that the rebels are foreign-sponsored “terrorists” attacking the regime. And he has helped that come about. Syrian lawyers have documented how in the early weeks of the revolt, the regime let out Islamist prisoners from Saidnaya prison—probably to foment radical Islamism within the opposition. While ISIS wages battles against the regime, including currently in the eastern province of Deir Ezzor, Aleppo, and Qalamoun, near Damascus, the goal of defeating Assad appears to be secondary to consolidating their own rule in rebel-held areas. Islamist militants dispersed a protest in Kafar Taharim with live fire. Making a revolution is never easy and every revolution must be ready to deal with the type of trickery and deception that the Syrian Revolution. AMMAN, Jordan -- Infighting among Islamist anti-government groups operating in northern Syria continued for a third day, as rebel factions engage in a large-scale rout against an extremist Al Qaeda affiliated group. Jaysh Al-Mujahideen (the army of the Mujahideen), a new coalition of presumably moderate Islamist groups, as well as factions affiliated with the Western-backed Free Syrian Army and the Islamic Front consolidated their gains against the Islamic State of Iraq and Sham (ISIS) in what activists are hailing as a "second revolution." The Turkish government reacted with a shutdown of the vital Bab Al-Salameh crossing on the Syrian border. "The rebels have achieved tremendous progress against ISIS in all the points of conflict, liberating more than 80% of the Idlib countryside and 65% of Aleppo and its countryside" said Abu Bakr, a media activist for the Sham News Network in Raqqa. None of the Syrian regime’s achievements matches its fabrication of the fundamentalist-terrorist groups that it pretends to fight and protect the Syrians from, opposition figure Michel Kilo wrote in the London-based newspaper Asharq Al Awsat. 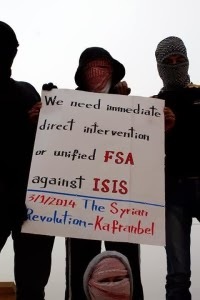 Such radical organisations did not exist in Syria before the revolution. The regime decided to create them, with the most successful one being the Islamic State of Iraq and the Levant (ISIL), the writer said. The ISIL has offered valuable services to the Syrian regime. It has undermined the Free Syrian Army (FSA), taken areas controlled by it and subjected the citizens to sectarian tyranny. This has started to persuade the people to accept a return to Mr Al Assad’s dictatorship, he added. The ISIL has also undermined the people and groups who began the revolution, and which the regime’s intelligence services could not counter initially. Civil forces, particularly the Union of Syrian Democrats, that are struggling to keep the goal of democracy alive, have also been weakened by the ISIL. The Union of Syrian Democrats was created by a variety of civil organisations and figures in an attempt to provide a unified political platform that reflects the wide civil and democratic grassroots groups that want an end to division among democracy advocates. Since its inception at the hands of outsiders, the ISIL has targeted areas that had already been liberated by the FSA, which left those places to fight in others. The ISIL had only a few overseas fighters in the beginning, so they took as their base Ar-Raqqah city after violently forced out the FSA. After crushing The Grandsons of the Messenger and The Eagles of the North using car bombs, the ISIL has threatened other organisations to provide it with fighters and its share of the spoils of war or else it would destroy them. Moreover, the ISIL has issued religious edicts declared as apostates the FSA, the Syrian National Coalition, the democrats, and Islamists who reject its methods, threatening to kill all of them – and have killed or arrested some. They have also terrified non-Muslims by kidnapping Christian priests including bishops Yohanna Ibrahim and Boulos Yazigi and Father Paolo. Finally, the ISIL has sought to win over the population using food assistance, and fighters using money and weaponry. In particular, it has recruited the regime’s Shabiha militias and embarked on hunting down the FSA, the democrats and journalists using lists provided by the regime’s intelligence services. Moderate Opposition positions were also attacked by Assad’s war planes between Atareb and Urem al-Kubra and also on the road north-east of Aleppo between Al-Bab and Bzaa, give rising to an increasing suspicion that somehow, in some devious way, ISIL is linked to the Assad regime. These accusations have been appearing for some time on the Internet and have gained strength since repeated barrel-bombing of civilians in Raqqah but not once an attack on ISIL’s very obvious headquarters buildings around the city. Moderate Opposition fighters have also discovered the passport of an ISIL commander in recaptured Jarablous, Abu Hafas Al-Masri, which clearly contains an entry visa for Shia Iran – rather odd for a supposedly Sunni fighter. It is also reported that since January 3rd ISIL has carried out 14 cars-bomb or suicide bomb attacks against the moderate Opposition – an intense record that it has never attempted against the Assad regime. The allegations of secret collaboration between ISIL and the Assad regime have been repeated this week by the Turkish Foreign Minister, Ahmet Davutoğlu, although he disingenuously lobbed the Kurdish Democratic Union Party, the PYD, Turkey’s arch enemy, into the mix as well.